These e-learning modules support the training of healthcare professionals involved in the delivery of the NHS Screening Programmes in England. Each module includes an assessment with a set pass percentage. When you have completed a module you can print off a certificate for your records. The NHS Fetal Anomaly Screening Programme (FASP) offers screening to all eligible pregnant women in England to assess the risk of the baby being born with Down’s, or Edwards’/Patau’s syndromes or a number of fetal anomalies (structural abnormalities of the developing fetus). NHS FASP aims to ensure there is equal access to uniform and quality-assured screening across England and women are provided with high quality information so they can make an informed choice about their screening and pregnancy options. Education and training resources are available for staff covering all stages of the process, from informing women of test availability, through to understanding and supporting their decisions. The `Screening for Down`s, Edwards` and Patau`s syndromes` e-learning module is a training resource for all practitioners involved in the support and delivery of the NHS Fetal Anomaly Screening Programme (NHS FASP) in England. NHS FASP recommend that all health professionals involved in offering screening for Down`s, Edwards` and Patau`s syndromes complete this resource every 24 months. The new e-learning resource explores many of the different and often difficult decisions women make and the possible impact of those decisions. It features film sequences and interactive aspects, which share learning and illustrate important issues. There is a quiz at the end of each unit. A certificate will be provided on successful completion. The Nuchal Translucency (NT) e-learning module is a training resource for all practitioners involved in support and delivery of NHS FASP Down’s, Edwards` and Patau`s screening in the NHS in England. NHS FASP recommend that all sonographers involved in offering screening for Down`s, Edwards` and Patau`s syndromes complete this resource every 12 months and evidence that learning. The 18+0 to 20+6 week fetal anomaly ultrasound scan e-learning resource is a training resource for all practitioners involved in the support and delivery of NHS Fetal Anomaly Screening Programme (NHS FASP) 18+0 to 20+6 week fetal anomaly screening in England. The overall aim of the resource is to enable practitioners to make the offer of the 18+0 to 20+6 week fetal anomaly ultrasound scan, understand the purpose and scope of the scan, and to explain the results to women. 18+0 to 20+6 week fetal anomaly ultrasound scan is a supportive resource and NHS FASP does not specify recommendation timescales for retaking the course. Each unit includes a quiz at the end so that you can test your own knowledge. The resource features dynamic film sequences which demonstrate shared learning and illustrate important issues. The fetal cardiac e-learning resource is a training resource primarily for sonographers involved in the delivery of NHS Fetal Anomaly Screening Programme (FASP) 18+0 to 20+6 week ultrasound screening in the NHS in England. The module covers the new three vessel trachea view (3VT) and reviews the existing four FASP cardiac views. A certificate will be provided on successful completion. NHS FASP recommend that all sonographers involved in offering 18+0 to 20+6 week ultrasound screening in the NHS in England complete this resource every 12 months and evidence that learning. © Public Health England 2017. These are not covered by the Open Government Licence. Contact PHE.screeninghelpdesk@nhs.net for all re-use enquiries. The Infectious Diseases in Pregnancy Screening (IDPS) e-learning module is a training resource for all staff involved in the NHS IDPS programme in England. This module is currently being reviewed and updated in line with the cessation of rubella susceptibility screening, new programme standards, revised care pathways and handbooks. The new module will incorporate film and video and will provide a greatly enhanced learning experience. It is planned for release during the Winter of 2017-18. Keep up to date with all NHS population screening developments via the Screening Blog. The NHS Newborn and Infant Physical Examination (NIPE) Screening Programme’s main aim is to identify and refer all children born with congenital abnormalities of the eyes, heart, hips, and testes, where these are detectable, within 72 hours of birth; to further identify those abnormalities that may become detectable by 6-8 weeks of age, at the second physical examination, and thereby reduce morbidity and mortality. These ages are recommended based on best practice and current evidence and should facilitate a prompt referral for early clinical assessment. The NHS newborn and infant physical examination e-learning module is aimed at health care professionals who undertake newborn and infant physical examination (NIPE) screening in the NHS in England. As a useful addition to formal training, the module uses film and animation to illustrate robust screening pathways and best practice. The NHS Newborn Blood Spot Screening Programme screens newborn babies for some rare but serious conditions. For each condition, the benefits of screening outweigh the potential risks. Newborn blood spot screening tests a blood sample that is taken from a baby’s heel and spotted on to a special card containing the baby’s and mother’s details. The sample taker sends the blood spot card to a regional newborn screening laboratory for testing. Newborn blood spot screening enables early identification, referral and treatment of babies with 9 rare but serious conditions. Babies who test positive can then be treated early, improving their health and in some cases, preventing severe disability or even death. The module contains information about informed choice and ends with an interview with a mother of a child affected with one of the conditions. It is aimed primarily at health professionals taking blood spot samples. At the end of module you will be asked 12 questions based on what you have learned, for which you have to answer 10 correctly, before being able to a complete the module. This module focuses on the newborn blood spot card. It looks at how the card must be filled out correctly in order to avoid errors that lead to avoidable repeat samples. The interactive card allows you to select each field on the blood spot card and learn about the importance of each section. New and revised fields are mandatory. The module also covers what happens to the blood spot cards after screening is completed, known as ‘residual blood spots’. It explains potential further uses which includes quality assurance and research. At the end of the module you will be asked 10 questions based on what you have learned, for which you have to answer 8 correctly, before being able to complete the module. The module is intended to support the work of the NHS Newborn Blood Spot Screening Programme and screening laboratories to standardise sample rejection criteria, and to support local initiatives to reduce the avoidable repeat rates. At the end of module you will be asked 10 questions based on what you have learned, for which you have to answer 8 correctly, before being able to a complete the module. The newborn hearing screening test helps to identify babies who have permanent hearing loss as early as possible. This means that parents can get the advice and support they need as soon as possible after birth. The NHS Sickle Cell and Thalassaemia (SCT) Screening Programme is a linked screening programme. It uses the Family Origin Questionnaire and blood tests, to screen pregnant women (and the baby’s biological father where relevant) to identify those at risk of having a baby with either one of two serious inherited blood disorders – sickle cell disease and thalassaemia major. People who have these conditions need specialist care throughout their lives. The SCT Programme gives parents time to consider the options available and make decisions for their pregnancy. It also screens newborn babies for sickle cell disease as part of the Newborn Bloodspot Programme. This means that babies can be given the best support and treatment from the very start. Introducing the sickle cell and thalassaemia screening e-learning resource. The toolbox has a summary of all the materials and references provided throughout the e-learning resource. All web links are correct at time of publication. This e-learning module is divided into 3 main sections – part 1, part 2 and a quiz. Level 1 – the first set of units which feature all the conditions you must detect for the antenatal screening programme. Level 2 – the second set of units feature more complex conditions. Please note not all the methods are available yet in the e-learning module. Quiz – The quiz features 20 multiple choice questions relevant to antenatal screening, which you can complete to test your knowledge and print a certificate for your portfolio. Each time you attempt the quiz, you’ll be given a random selection of questions. Good Luck! The NHS Abdominal Aortic Aneurysm (AAA) Screening Programme aims to reduce premature deaths from ruptured AAAs among men aged 65 and over by up to 50% through early detection, appropriate follow-on tests and referral for potential treatment. It offers all men an ultrasound scan of the abdomen during the year they turn 65 while men over 65 who have not previously been tested can self-refer for screening. This module consists of two units and has been designed to help support the same units in the Diploma for Health Screeners (Abdominal Aortic Aneurysm). These are also the e-learning units for knowledge assessment for the reaccreditation of existing qualified screening technicians. Learners must complete the quiz at the end of each unit, the pass rate is 90%. This module consists of seven units. There is a quiz at the end of the clinical units, the pass rate is 90%. 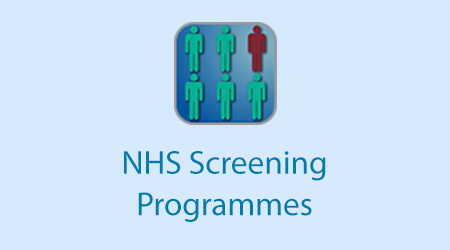 The NHS Breast Screeing Programme (BSP) is an NHS population screening programme. The NHS BSP offers screening to all women aged 50 to 70. This module comprises of the guidance and toolkit related to the clinical responsibilities and processes to be undertaken for women presenting with an interval cancer between routine breast cancer screening. This includes the offer of a review meeting to the woman to discuss the outcomes of her case review. The film has been developed to support clinicians undertaking the meeting. This e-learning course has been created for all sample takers in England. The e-learning is based on a previous model used in Northern and Yorkshire region and we would like to acknowledge and thank contributors for sharing their resources. It is a nationally approved resource designed to meet the requirements of mandatory three year update training. It will help you maintain, improve and update your knowledge of the cervical screening programme and includes information about current changes to the programme. This national e-learning module on primary HPV screening has been developed for colposcopists working in the NHSCSP. It aims to provide colposcopists with the with confidence to follow the primary HPV testing pathway and discharge appropriately. The module consists of 5 units. Sample takers have an important role in ensuring women understand the concept of hrHPV testing and the results of their screen. This national resource on screening using primary hrHPV testing has been developed for sample takers working in the NHSCSP. It may also be a useful resource for colposcopy nurses, as women often have questions about hrHPV testing on attendance at colposcopy. The module features film sequences and interactive aspects, which share learning and illustrate important issues. A certificate is provided on successful completion of the assessment module. Modules to be completed by healthcare professionals working in the NHS Screening Programmes. The Antenatal and newborn screening e-learning module is a flexible cross-programme training resource for all health care professionals and students involved in antenatal and newborn screening in the NHS in England. It enables learning to be evidenced and promotes informed choice for patients and their families regarding screening. NHS Screening Programmes each have a defined set of standards for providers to meet to ensure that services are safe and effective. Quality assurance (QA) is the process of checking that these standards are met and encouraging continuous improvement. The modules in this section are for healthcare professionals to use to ensure screening services are of a high quality. If you already have an account with e-LfH, then you can enrol on to the NHS Screening continued professional development programme by logging in to the e-LfH Hub, selecting My Account > Enrolment and selecting the programme. You can then access the programme immediately in the My e-Learning section.